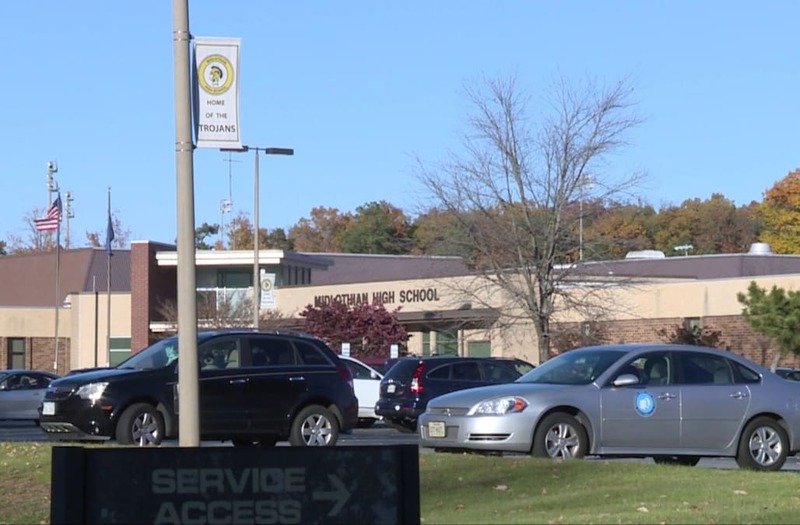 CHESTERFIELD COUNTY, Va. (WTVR) -- A guest speaker was removed from a high school assembly Monday morning after an inappropriate image appeared on a large screen at the beginning of his presentation, Midlothian High School principal Shawn Abel said in a message to parents. The image was pornographic in nature, according to people who were in the room during the Career Pathways program assembly at Midlothian High School. "The image came from the mobile drive provided by the outside speaker. The guest speaker was immediately removed from the assembly, and the remainder of the event went on as planned," Abel said. "Like you, I am very concerned that a distraction caused by an outside speaker would become the focus of an otherwise important conversation with our students. We will redouble our efforts when we coordinate events with outside speakers, including screening the presentations ahead of time." A guest speaker was removed from a high school assembly Monday after an inappropriate image appeared on a large screen at the beginning of his presentation. The Career Pathways program assembly was attended by school's sophomore class. CBS 6 spoke with one student who was in the assembly when the incident happened. He said the room fell silent for a few seconds because no one could really tell what was going on. “I looked at it again and I was still really confused. Then I was like ‘oh’ and they shut it off and took the guy out and that was basically it,” said Sophomore John Williams. The teen also commended the school for their quick response. “I think that the school did a really good job with the way that they handled it, by emailing the parents, instead of having them find out through us,” said Williams. CBS 6 has confirmed that the guest speaker was employed with Bon Secours as a x-ray technician. Witnesses can send news tips here.